Ive been using the Hindi script (Devanagiri Sangam MN, Kruti Dev 021) and there is discrepancy in the way characters show up on Affinity. Attached two files: first one is the correct typo of the first 3 hindi texts, second one is the affinity file with character mismatches. Let me know how to proceed. Thanks! is anyone looking into this issue? Is there an existing thread that responds to this issue? Please help. Apologies for not replying sooner. I've just looked in our bug database and this issue has already been logged with us. I will bump the original report as it hasn't had any movement for a while. thank you. any new update on this issue? No, sorry Sarmishta. We have known about the bug for a short time and it has been bumped since you raised it again. We have to wait between beta releases to test fixes but not all bugs get fixed in time to make it into the new beta. I would check the changelist whenever a new beta is announced on the forum. ok, just be sure to check other fonts too. Ive faced the same issue with Tamil native scripts. So, what work-around do I have in the meantime? This hasn't still been solved, I guess. I'm facing similar issues in Affinity Designer (the latest version) as well. First file below shows a text (Triple) and it's literation in Gujarati - the correct way. Second file shows the same text (Triple) in Gujarati in Affinity Designer - displays wrongly. 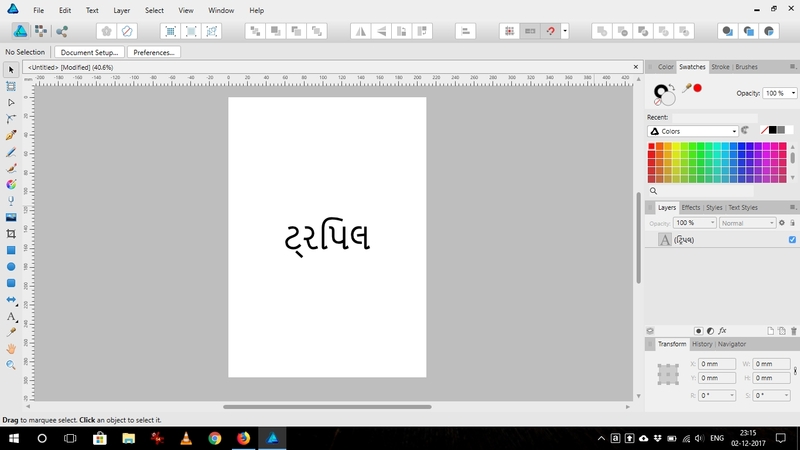 I was looking to ditch CorelDraw and completely move to Designer but now have to stop short as I have to type in Gujarati for most of my work. And it does not work with Copy, Pasting from Translate as well, so it's not that Designer would just type incorrectly. I hope this can be addressed sooner than later. I believe this is something that would get addressed once Publisher has been released as it really needs to be working for an application that focuses on text. I don't have any more info at the moment—I'm sorry. Hi Chris, Nice to hear from you. Looking forward to this issue being resolved in Publisher. Do you guys, by any chance, have a beta/testers' program for Publisher? I am really really really keen to ditch Corel and jump on Affinity bandwagon. Desperately waiting for Publisher to come out, so I could yell "Take my money" (well, just because I know you guys ain't greedy on that front) and be done with Corel fleecing small ppl (like me) off. Anytime (sign me up wherever however for the Publisher) ! Just FYI, I am into designing adverts, flyers, office literature, etc. We're a small biz and can't afford designers/artists, and since I know a bit, I do it for the biz myself and can't see myself paying the eye-watering prices Corel asks for. Then, someone recommended Affinity, which I am finding very useful but have to stop short when it comes to writing text in Gujarat/Hindi language. Any update on this issue?? I'm afraid not. The bug report has been 'postponed' which generally means a fix will be released for a big update or new app, such as Publisher. I want to report that I also need help with this issue. Usage of Native languages has seen steep increase (during last year and this one) in India due to increased internet penetration. To cater to this newly online audience, have been creating some stuff using Affinity. This issue hampers my workflow a great deal. Is there any workaround? Have been creating for long in Affinity and love it. Don't want to go look elsewhere for this little thing. I wish this issue comes back from the freezer and gets resolved. Native language content is hot in India right now. P.S. Waiting for Publisher's release. That would be a great day !! Serif still does not support Indic Open Type features. But ANSI Indic fonts works in Affinity. Do you know where I may find ANSI Indic fonts? I use ShreeLipi (www.modular-infotech.com) Devnagari fonts for more than 10 years with Serif's Plus Range. But I'am not sure present version (7.4) did works or not with Affinity as I create my own Keyboard Driver (www.keyman.com) with Keyman software which works with all languages with applications in Windows, Linux & Mac. I wish serif support Indic Languages. Thanks Arun. Nice work with Keyman! I'm positive that the team at Serif is going to add support for Indic languages.